The Rail Master Universal with the black body. a 1/3N Lithium battery with more than 4 hours of life. Crimson Trace says this laser is factory sighted at 50′. You can adjust it for windage and elevation, and install it yourself. The laser is backed by a three-year warranty. Price (approx. ): $94 for the red laser, and $122 for the green laser. On Amazon, the red and green lasers combined hold an outstanding 4.65 average rating across roughly 1,000 votes, with only 2% of those votes falling in the 1-star camp. It also appeared in six of the 12 “best of” lists I found via Google. The C5 from the left. an install kit that includes a battery, three unique rail sets, one pin removal tool, two wrenches and two mounting screws. 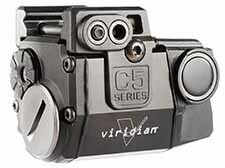 Viridian says this laser is factory sighted at 50′. You can adjust it for windage and elevation, and install it yourself. 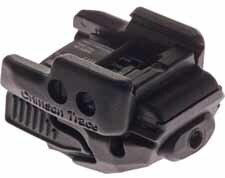 It slides onto the tactical rail and is held in place by a mounting screw. The laser is backed by a 30-day money back guarantee, and a limited seven-year warranty. Price (approx. ): $130 for the red laser, and $239 for the green laser. On Amazon, this laser holds a well above-average 4.2+ average rating across roughly 100 votes, with 6% of those votes falling in the 1-star camp. It didn’t appear in the 12 “best of” lists I found via Google, but its sibling, the C5L laser-light combo, appeared in seven. I was disappointed that out of all the rail-mount lasers I looked at, only two featured superior ratings. There are a lot of mediocre/average laser sights out there, and a lot of outright junk, too, especially among those on the inexpensive end of the spectrum. Several lasers have promising-looking average ratings but not enough votes yet to make them statistically significant. 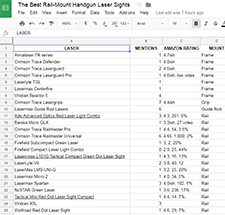 I almost included the Lasermax Spartan because it appeared in three of the 12 Google search results, and the red laser model sports a 4.4 average rating. That rating came with only 50ish votes, however, and the green laser model has a putrid 3.5 average ratings over another 50ish votes. I read through the negative reviews and didn’t find a reason why the red is better than the green. I think that’s because the laser color doesn’t matter with this laser, and that as more votes come in, the average rating on both will move toward a mediocre 3.9ish. Also, a warning: Steer clear of the NcStar handgun laser sights because almost all of them feature below average ratings. Exhibit A is the NcStar Compact Green Laser, which offers a 3.6 average rating across 236 votes, with a whopping 17% of those votes falling into the 1-star camp. That’s it for this year. Hopefully some new, good rail-mount laser sights will hit the market in 2018, and I’ll keep tabs on the current crop, too. Jed Henson runs the review and ratings sites HandgunLasers.net and GunsGunsGuns.net.